Intermountain Horse Association Poker Ride Results 2015! Saturday September 19th, 72 degrees F and sunny! 59 riders of all ages participated in the IHA Poker Ride at Alderfer Three Sisters Open Space Park in Evergreen. The last two years were cancelled due to Insurance Issues and Vesicular Stomatitis, but this year brought in one team shy of the 60 horse and rider record set a few years ago. Ashleigh Olds DVM of Aspen Creek Veterinary Hospital and several of the staff helped check all horses for Vesicular Stomatitis. In addition, Jeffco HEAT and the Colorado Horsecare Foodbank volunteers showed up in force to work the stations, set up, clean up, help with registration, serve food and help with parking. Riders left at their own pace and picked up five cards along the set trail course to make up their five card poker hand. At the finish, while the horses munched on their hay at the trailers, the riders enjoyed a catered lunch while they awaited the results. Mary McGhee won the highest poker hand receiving $300, and Jess Austin won the lowest hand and $100! The remaining proceeds of over $1200 was split between two of our local, but nationally known organizations – Jeffco HEAT and Colorado Horsecare Foodbank. Jeffco HEAT (Horse Evacuation Assistance Team) was founded in 2002 in Conifer by resident Scott Halladay. It is volunteer organization that is dedicated to serving and rescuing large animals because of wild land fires, natural disaster, accidents, animal cruelty and impounds. Under the direction of the Jefferson County Sheriff’s Office, Animal Control Division (or other County law enforcement), Jeffco HEAT has assisted in the rescue of more than 2,500 animals and has been on the scene of many of the front range’s major wildland fires (i.e. Hayman, Lower North Fork, Black Forest, Lime Gulch) as well as the flooding in the fall of 2013. The dedicated volunteers of Jeffco HEAT are committed to a high degree of training and safety. All members are certified in First-Aid/CPR, basic wild land fire training, possess a working knowledge of the Incident Command sys­tem and are familiar with radio opera­tions and protocol. The “fire” team has further wild land fire certification training obtained through the Jefferson County Incident Manage­ment Team and other local fire depart­ments. In addition to the fire training, some members also have certifications in tech­nical animal rescue, high angle rescue and swift water rescue as well as formal radio operator training. Jeffco HEAT is equipped with a Colorado Department of Agriculture rescue trailer, containing essential lifesaving equipment needed for rescues such as an Anderson Sling, a rescue glide, a generator, and rescue ropes. Go to JeffcoHEAT.org to learn more, volunteer and donate to this important organization. 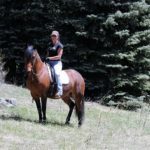 Colorado Horsecare Foodbank was started by Evergreen resident Juliana Lehman in 2009 after the economic crash of 2008. The drought across the United States sent hay prices sky high, while people already struggling in the economy were losing ground trying to feed and care for their horses. Knowing the importance of keeping horses with their families going through temporary hard times, CHF formed and raised funds for hay, farrier and veterinary care for these horses and people in need. CHF has continued to keep up with the needs of horses, other hooved animals and their people. In the fires of 2013, CHF supplied over 90 tons of emergency hay to the Black Forest fires to feed starving horses whose owners had lost their homes, barns and significant stockpiles of hay. That September brought the devastating floods in Northern Colorado. CHF supplied over 500 tons of emergency hay and established a hay storage station to help to feed horses, llamas, alpacas, cattle, sheep and goats, whose hay, shelter and barns had been washed away. After six years in operation, dealing with natural disaster response with an all-volunteer team, Colorado Horsecare Foodbank earned the attention of several prominent animal welfare groups which provided grants for growth, expansion, more hay, outreach, and education, including the American Society for Prevention of Cruelty to Animals (ASPCA), Banfield Charitable Trust, Colorado Unwanted Horse Alliance, and the Sally Beck Foundation, businesses, and charitable foundations. Moving forward in 2015, Colorado Horsecare Foodbank is working to secure multiple locations along Colorado’s Front Range for permanent storage of emergency hay, as well as obtaining more heavy equipment, building up its education and outreach programs, and much more. For more information go to www.horsefoodbank.org. The Intermountain Horse Association invites you to the first meeting of the fall on October 20th. 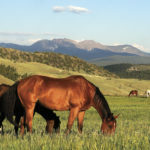 IHA meets in the slower horse activity months of October – May, every 3rd Tuesday at Beau Jos in Evergreen in the Event Room from 6:30-8:30pm, the speaker starting at 7pm. Food and beverage are available for purchase, but optional. It is a perfect way to socialize with other horse people in your community, enjoying interesting and informative speakers. A great line up of speakers are in the works that apply to all shapes of horses and saddles! 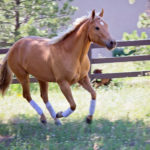 Visit the IHA facebook page at www.facebook.com/IntermountainHorse for the latest. Thank you to all of the IHA Poker Ride sponsors: MtnHomes4Horses.com at RE/MAX Alliance 303-638-0994 – helping buyers and sellers of properties for horses and their people; Aspen Creek Veterinary Hospital 303-697-4864; Amy Dunkelman – Double H Horse Boarding & Training at Broce Ranch + Mountain Homes & Horses, LLC. Coldwell Banker 303-921-0315. See you at the October 20th meeting! Heather McWilliams © 2015.